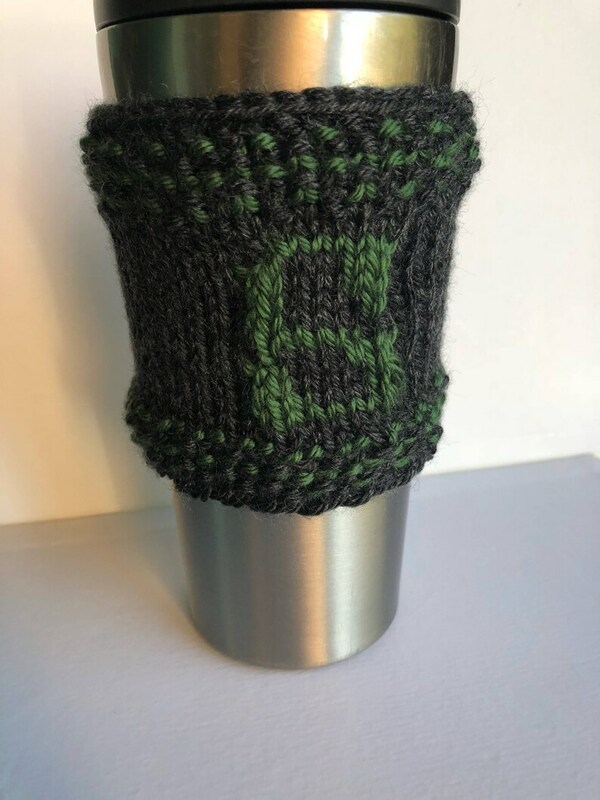 Hand knit cup sleeve. Knit in dark grey, with knit green S and green in the border. This mug cozy is ready to ship. If you like this design but would like a different color please feel free to send me a message I can do many different color combinations and letters. Beautifully made, Michaela is very responsive, these shipped extremely fast- especially for a custom order, and I can’t wait to give these to my Harry Potter obsessed friends. Thank you!!! Beautiful work! Timely shipping. I’m overjoyed with my purchase. Just what I wanted. Seller had to make them to order but shipped quickly. Just what I wanted. Seller had to make these to order but shipped them quickly. Now with direct checkout you have several buying options. I have in the past accepted checks, if you are more comfortable sending a check via mail please send me an email or message and I can gladly accommodate that, just know your item won't ship until I receive the check. As a general rule all sales are final. But I do handle returns on a case by case basis. Orders ship within one business day via USPS unless otherwise noted. On most occasions if you order before 12EST your order will be shipped same day. I ship First Class USPS which usually takes 2-5 days to arrive. I am now offering USPS Express shipping and USPS Priority shipping. If you would like to upgrade your shipping simply purchase from the links below. International shipping can take up to several weeks depending on your countries specific customs regulations. Color: One monitor will display color differently from another; please take this into consideration when ordering. Though I only use pictures that I feel reflect true original color, I cannot guarantee that what you recieve will have the exact color(s) of what you see on your screen.